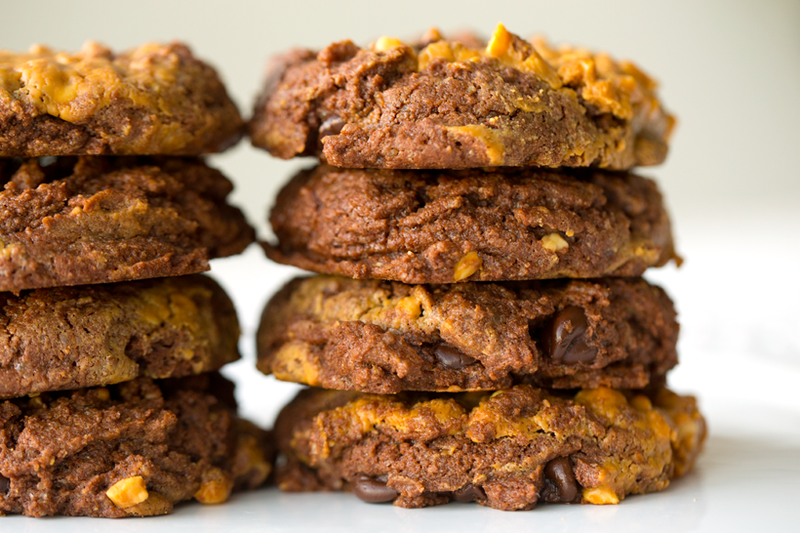 Today's Double Chocolate Peanut Butter Cup Cookies totally remind me of sleepover parties. Here is why..
Way back in my youth, the age before Netflix and iPhones. (Although a few 'cool' girls had pagers or Zach Morris phones.) Sleepover parties meant a few things..
1) Renting a movie from Blockbuster, something like Speed, so we could watch Keanu Reeves flex his muscles and save Sandra Bullock. 2) Staying up late playing games like Truth or Dare so we could learn each others deepest darkest secrets and crushes. 3) Camping out on the floor in sleeping bags and making sure you brought some cute, socially acceptable PJ's to wear. 4) Food. Pizza, candy, chips and soda. Maybe some carrot sticks and hummus to please the mom-on-duty. And always baking something sweet. Did your friends bake at sleepovers too? 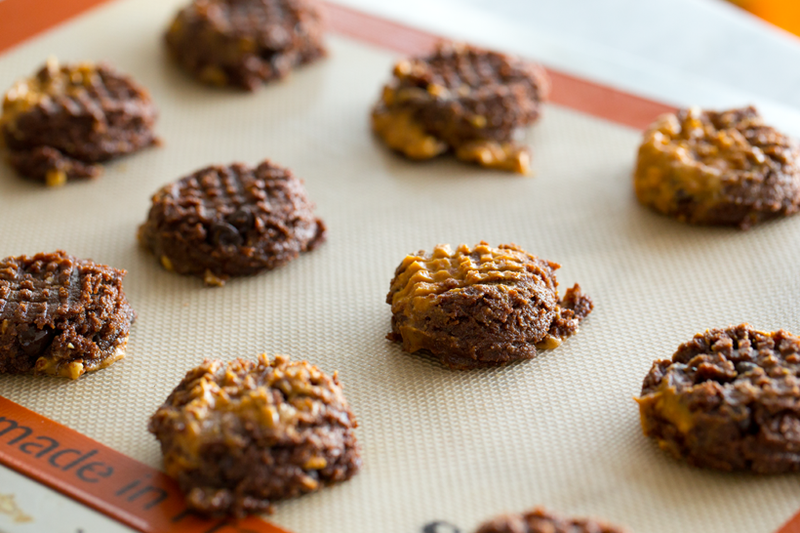 Most times, the preferred midnight-ish snack was to pull out a box of brownie mix and swirl about half a jar of peanut butter into the top layer before baking. Peanut butter brownies all fudgy and rich. ..Well, coming back to my point, that is exactly what these Double Chocolate Peanut Butter Cup Cookies remind me of. 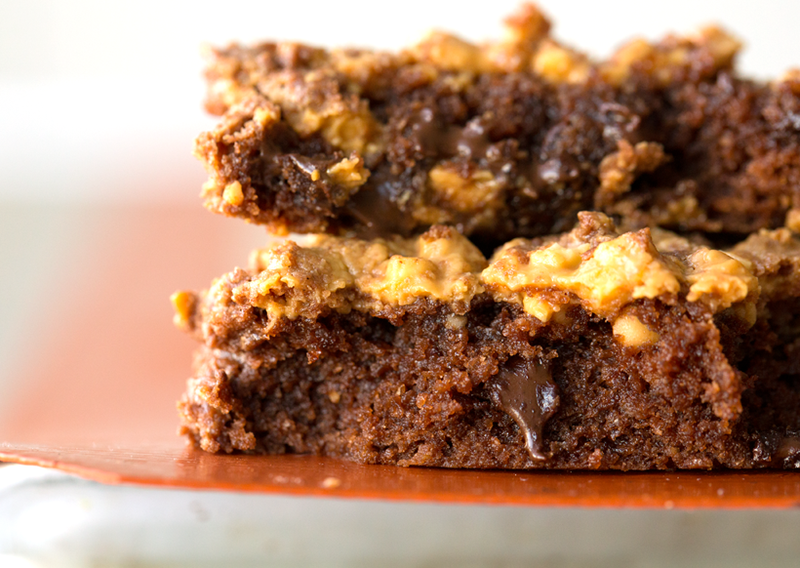 Those slumber party out-of-the-box pb brownies. 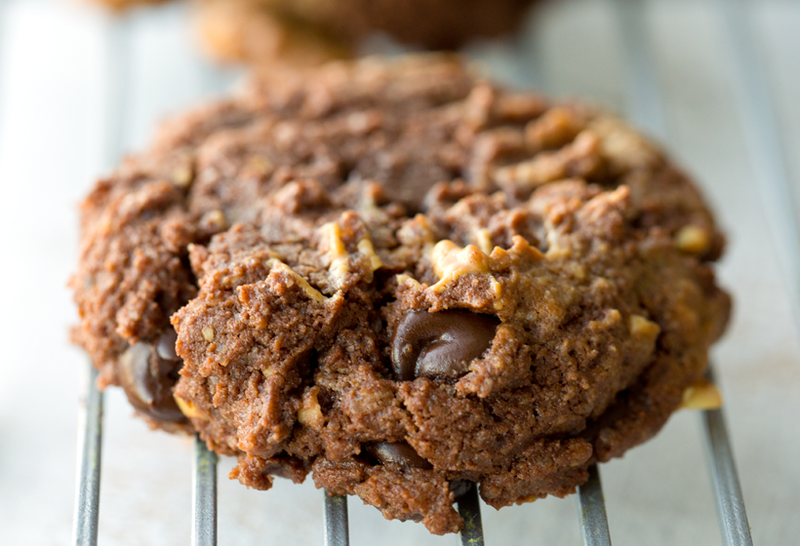 The peanut butter is gently swirled into a moist and rich double chocolate chip cookie. 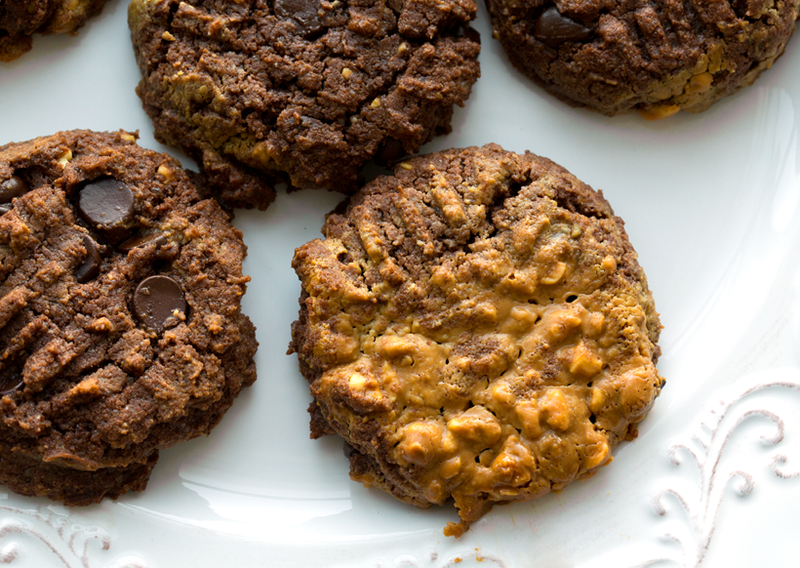 The major difference between then and now, these tempting treats are vegan. 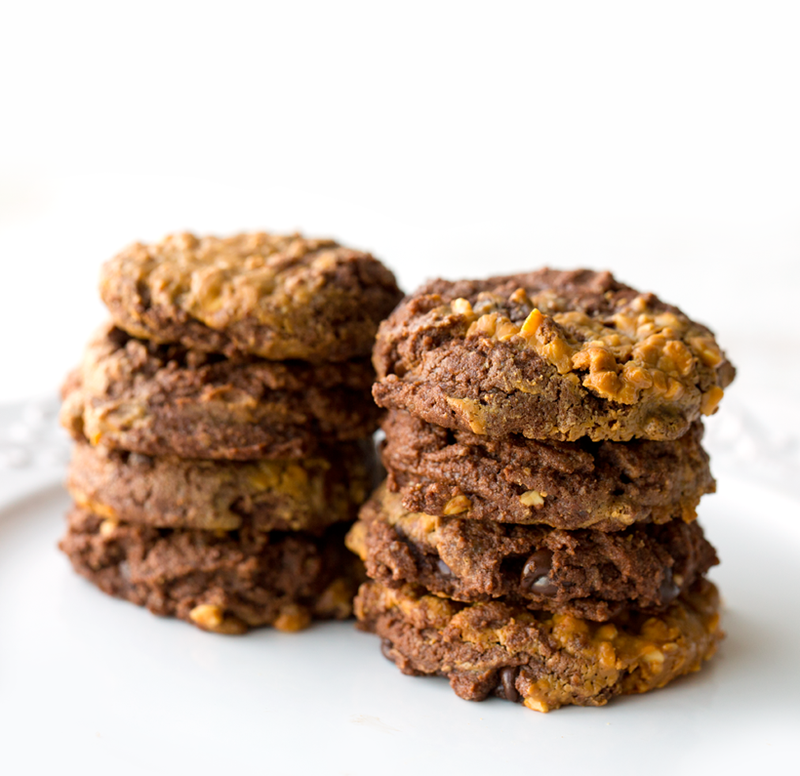 So the next time you crave some peanut butter cup flavors or need a girls night midnight snack, try these cookies! oh and ps. Why oh why did they make a Speed 2 without Keanu? I don't even remember if I saw it, Speed 2: Cruise Control, but upon googling Speed to double check the year it came out, 1994 btw, I remembered they made a Speed 2. Without Keanu's muscles. Poor Sandra. Tragedy. Loading up the baking sheet..
See? Total pb brownie effect here.. 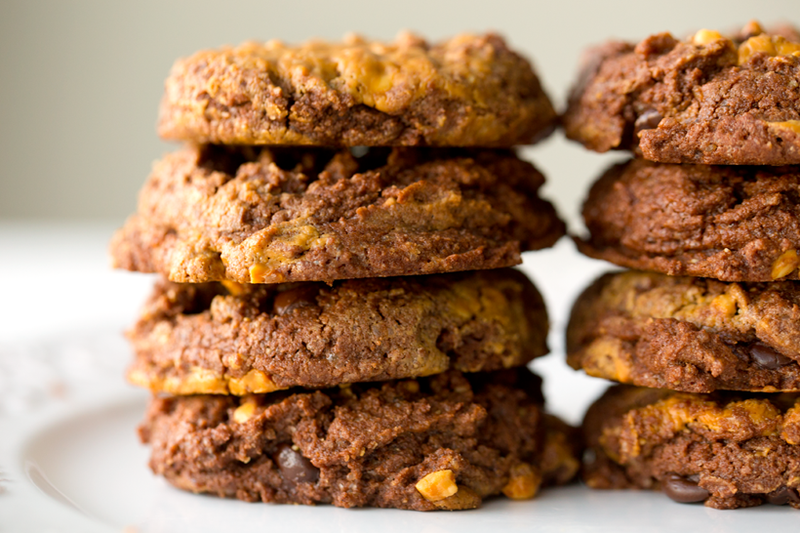 I loved how different cookies had different amounts of peanut butter on top. 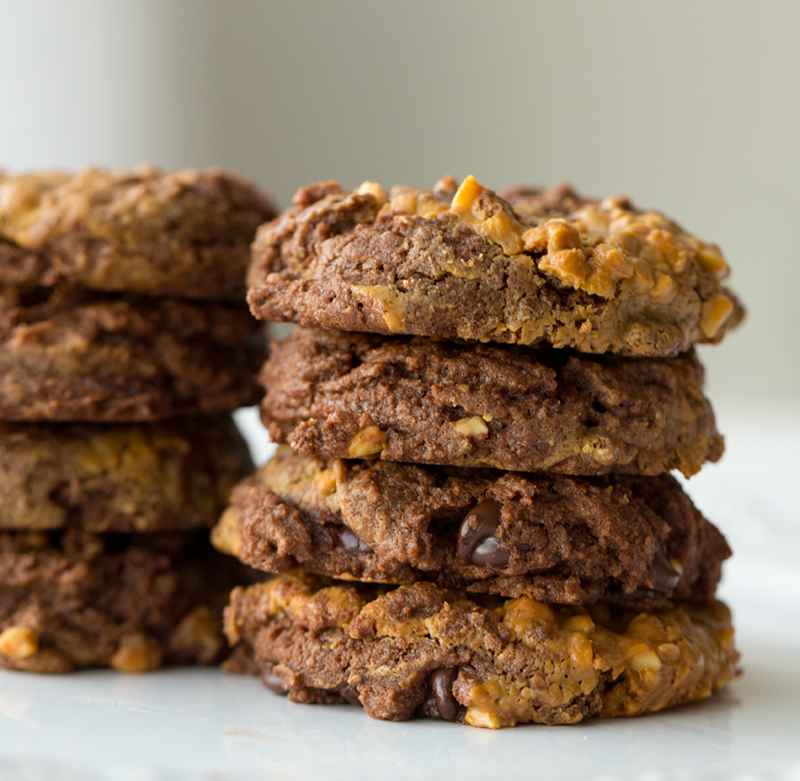 These rich peanut butter and chocolate cookies are a delicious vegan treat! 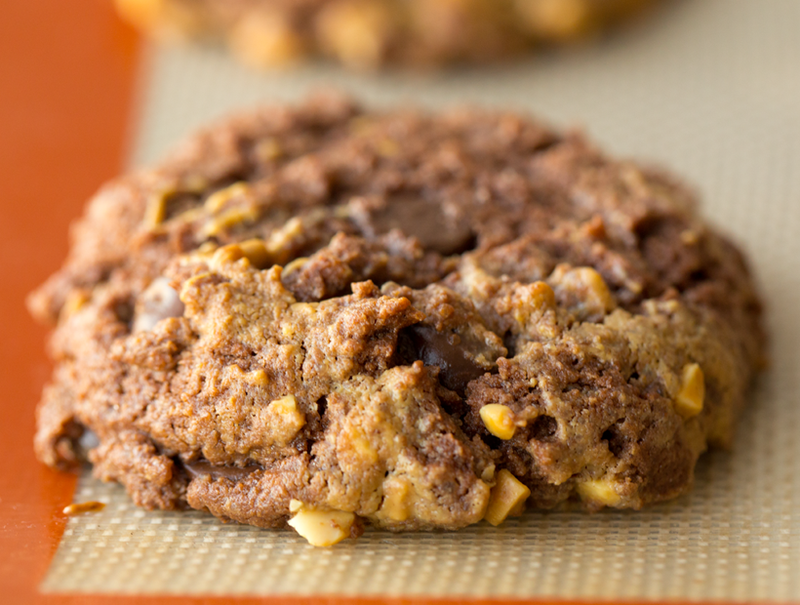 A warm swirl of peanut butter melts into chocolate chips and a chocolate cookie base. Preheat oven to 375 degrees and grease a baking sheet -- or use a liner like Silpat or parchment paper. In a large mixing bowl combine the dry ingredients. In a blender, combine the wet ingredients. Blend until smooth. Tip: blend on low speed setting or let wet mixture sit for 1-2 minutes to let the flax seed plump up a bit. Pour the wet mixture into the dry bowl and combine. Stir until a dough forms. If your dough seems a bit on the dry side (usually based on the type of flour you use) add 1 Tbsp warm water to soften. Fold in the chocolate chips. Then very lightly fold in the peanut butter "swirl." Scoop or roll balls of the dough and place on baking sheet. Continue until all the dough is used up. 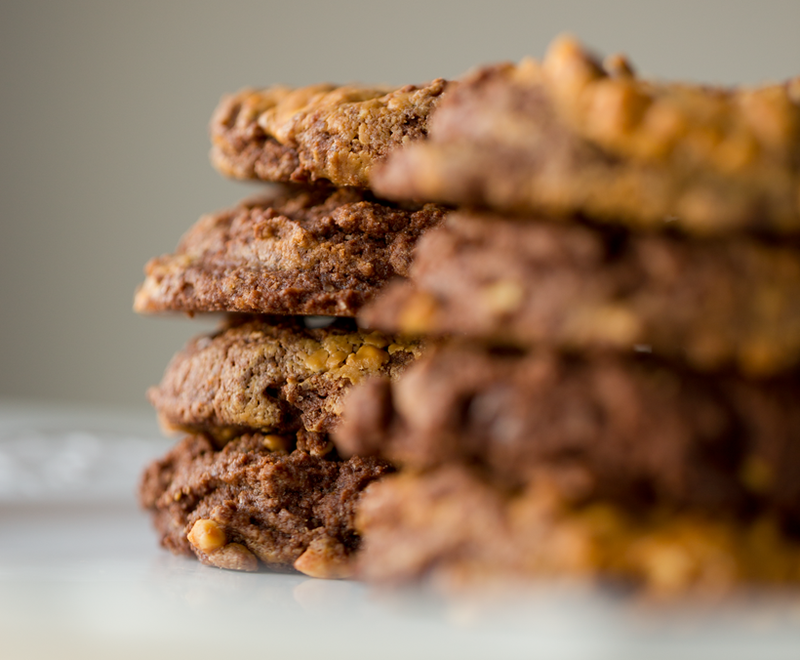 Optional: press down cookies using a fork, in the same design as you would do for traditional peanut butter cookies. Bake at 375 for 12-14 minutes. Cool on a baking rack for 5-10 minutes before serving.